"Laden reprises the format of 2000's Peek-a-Who in this equally enjoyable follow-up-and, really, is there a more aurally pleasing and fun-to-say vowel sound than the long "oo"? 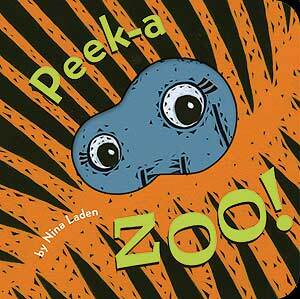 Blobby die-cuts give readers a glimpse of the animal to be revealed on the following page: "Peek a... Cockatoo!" writes Laden as her chunky, printlike paintings show the bird's lurid yellow crest amid a cloud of airborne feathers; "Peek a... Bamboo!" highlights a panda chomping down on its favorite treat. As in the previous title, an inset mirror closes out the book, leaving readers with a crowd-pleasing "Peek a... you, too!" "Reprises the format of 2000's Peek-a-Who in this equally enjoyable follow-up."